Amigo Slots is a brand new online gaming casino from the stable of Jumpman Gaming. Just like the name, Amigo Slots is friendly and easy to play. The website uses very simple graphics and colourful design to present a platform is gives a satisfying feeling of beauty and quality. The rich blend of orange; white and other colours presents an Amigo Slots that looks inviting. Once you are in, the first thing that you notice is the welcome offer. 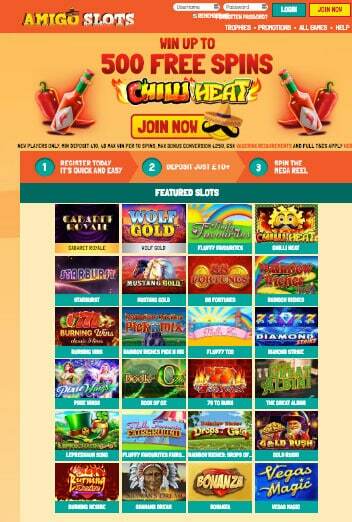 Amigo Slots offers new players a chance to earn a massive 500 extra spins on Chilli Hot. Meanwhile, they also offer promotions and loyalty programs. More importantly, Amigo Slots is a UK mobile slots platform that features a selection of some of the hottest UK slots. So, if you crave fun, it is certainly guaranteed at Amigo Slots. The website is secure. Notice the lock sign? Amigo Slots currently has a valid certificate issued by CloudFlare Inc. In addition, Amigo Slots also uses the same SSL encryption that is obtainable in the industry to mask the entire platform. Certainly, Amigo Slots wants you to play with your mind at peace. Hence, they give you the assurance that all your banking details and personal information are safe. As a matter of fact, it is their duty and it is the duty of the UKGC and the AGCC to ensure strict compliance. Certainly, with these two manning the affairs of Amigo Slots, players have no reason to worry about security and fair gaming. However little it may be, every online casino does offer players some bonuses. In fact, the welcome bonus is one feature that players always look up to when they join a new casino. Likewise, Amigo Slots offers every new player a good welcome bonus. Firstly, all you have to do is make a minimum deposit of ₤20 and you get your chance. It is not certain what the welcome offer would be. However, it is certain that you would surely receive a welcome gift from Amigo Slots. In the end, players could win either an Amazon shopping voucher that is worth ₤10 or as much as 500 extra spin. The voucher will be sent to your mail within 7 days. However, if for any reason you do not receive it, Amigo Slots will not be held responsible. As for the extra spins, you’ll have to wager it 65 times. Newbie: This is where it all begins. Everyone has to pass through this stage. However, how much time you spend here is completely up to you. In the end, you will receive 5 extra spins; birthday bonus and no daily cashback. Expert: If you are here then you must have collected at least 101 kudos. The benefits are the same as the newbie except that you get a 1% daily cashback. Pro: When you have gathered up to 1001 kudos, then you qualify to be a Pro member of the VIP club. At this stage, you will receive more extra spins and also enjoy a 3% daily cashback. VIP: It takes at least 2501 kudos to get to this level in the loyalty program. Likewise, members receive an improved reward with 5% daily cashback. Legend: This is the height of the loyalty program at Amigo Slots. You must have gathered more than 5000 kudos to qualify and that’s a lot. Meanwhile, you get to enjoy plenty of rewards that also include 10% daily cashback. Talking about kudos, it’s ₤1 = 1 kudos. Meanwhile, the maximum conversion is capped at ₤250 while the wagering requirements still sit high at 65 times. Bingo Games; Hot slots; Progressive jackpots; Amigo Slots puts together a selection of some of the best titles. Enjoy a selection of the best brands from top provides that include Eyecon; Pragmatic play; NetEnt; Playson etc. Amigo Slots features a few banking options. However, they offer quick payment solutions. So, transactions are usually processed on time. Even more, players can get in touch via email and live chat anytime.